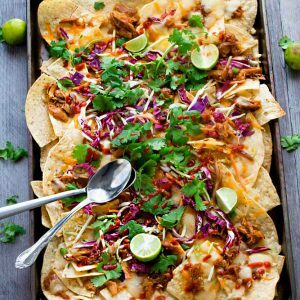 Asian Chicken Nachos – a simple and flavorful appetizer perfect for parties, game day or any meal you want. Best of all, easy to make ahead in the slow cooker or the Instant Pot. 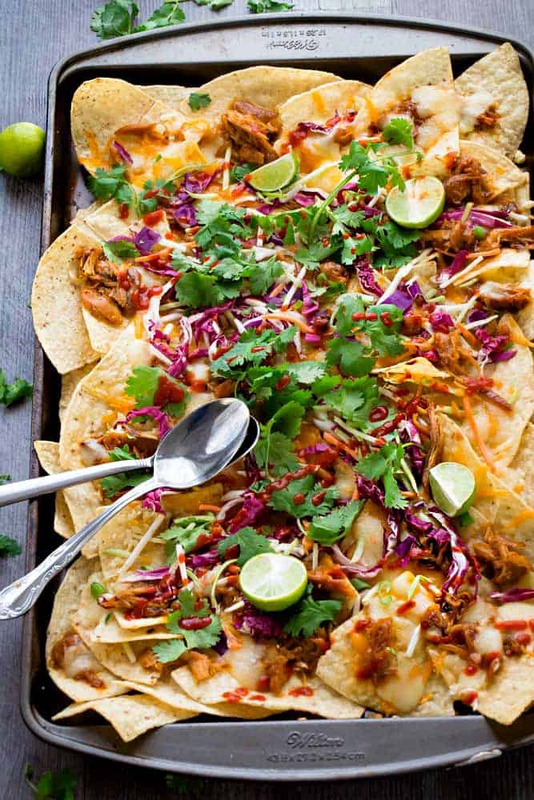 When it comes to weekend or party entertaining, nachos are always a fun option to serve. They make delicious game day appetizers and I love how fun and easy they are to put together. 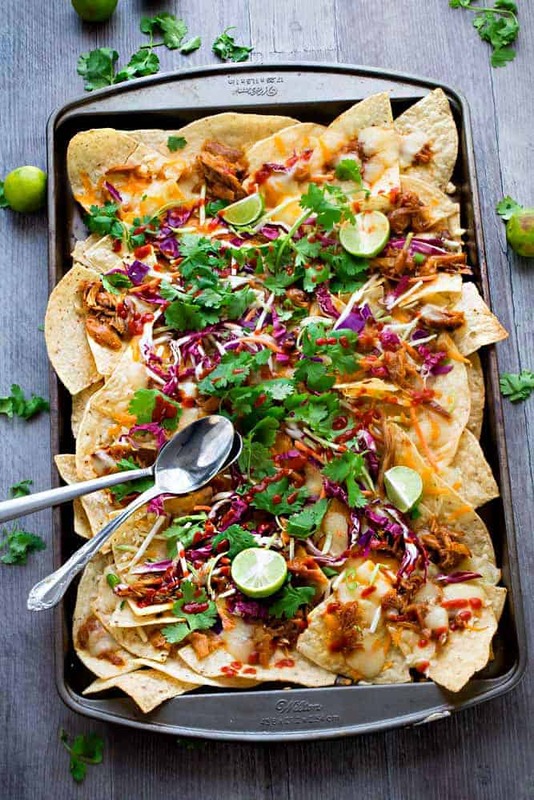 These Asian Chicken Nachos are loaded with flavor and would be perfect for any upcoming Super Bowl parties. The sweet & fiery chicken is flavored with buffalo sauce and Thai sweet chili sauce. If you’re using your crock-pot, slow cook the chicken for 3-4 hours or make it in your Instant Pot in under 30 minutes. 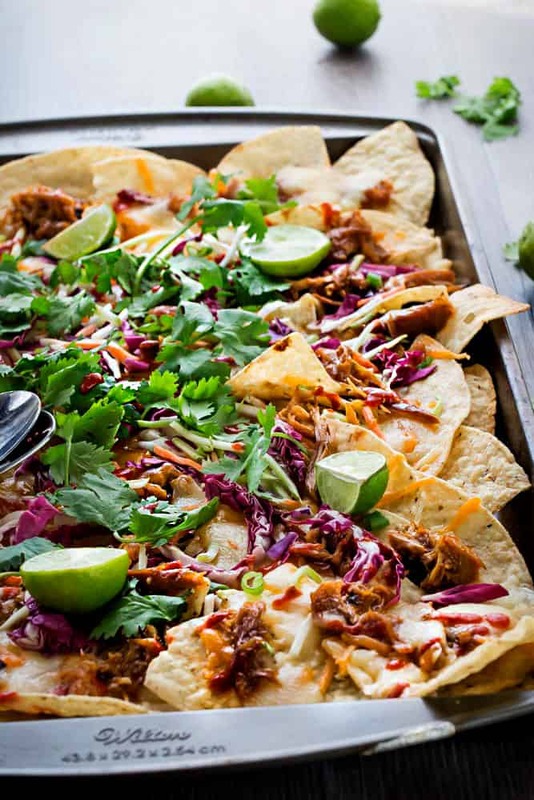 The marinated cabbage is what gives these nachos that extra-special crunch and big punch of flavor. We love making a double batch and storing leftovers in the fridge. You can keep it on hand to serve on tacos, sandwiches or as a simple and delicious side with any meal. After you cook and shred the chicken, line a large baking sheet with foil or parchment paper. Arrange half of the chips on the prepared sheet and top with half of the shredded chicken, then layer with half of each cheese. CAN I MAKE THE CHICKEN IN ADVANCE? Yes! 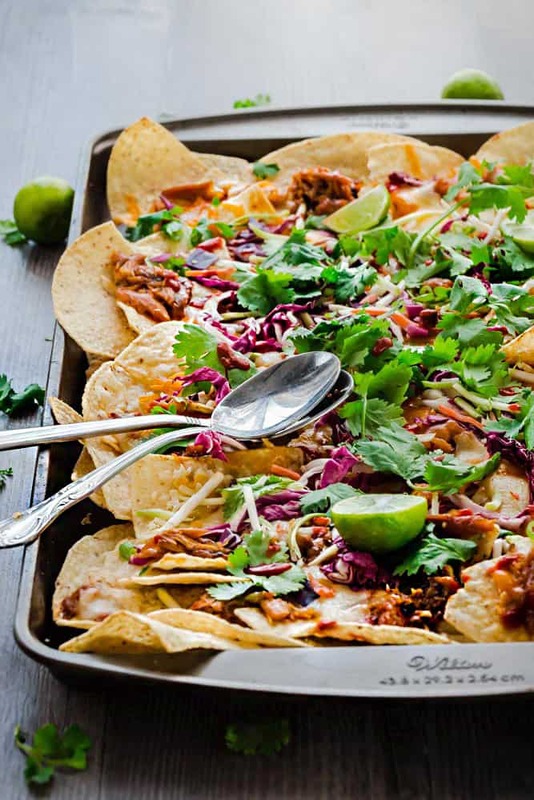 If you’re preparing it the day before, just store the chicken and sauce in the refrigerator until you are ready to make the nachos. Or double the recipe and use the remaining chicken for tacos, sandwiches. In a medium, sealable bowl, combine the vinegar, sugar and salt, then add the carrots and cabbage. Cover the bowl and store in the refrigerator until ready to assemble the nachos. To make the chicken in the slow cooker: Combine the buffalo sauce, sweet chili sauce, honey, soy sauce and red pepper flakes in the bottom of the slow cooker. Combine the buffalo sauce, sweet chili sauce, honey, soy sauce and red pepper flakes in the insert of the Instant Pot. Lock the lid in place and turn the heating valve to steaming. Press the MANUAL or PRESSURE COOK button on HIGH for 5 minutes. Allow the chicken to naturally release for 5 minutes, and then quick release the rest. Remove the tray from the oven and top with the jalapenos, green onions, marinated cabbage, and fresh cilantro.